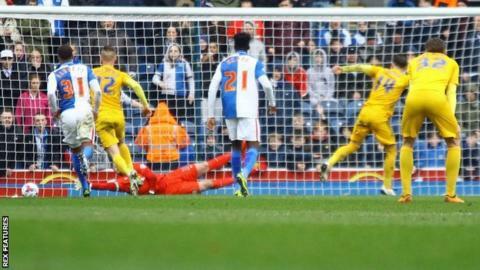 Preston North End kept their slim play-off hopes alive with a narrow win at 10-man Blackburn. The hosts took the lead through Elliott Ward before Shane Duffy was sent off for handling a Joe Garner effort on the line and the former Rovers striker then levelled from the spot. Jordan Hugill's volley put Preston in front just before the break. Rovers pressed for an equaliser after the break, but visiting keeper Anders Lindegaard was largely untroubled. The home defeat capped a bad week for Rovers after they announced the club's debts have exceeded £100m earlier this week. They started brightly and Ward's close-range volley after Hope Akpan's header had come back off the bar gave them a deserved lead before Duffy's red card changed the complexion of the match. Preston have now won six of their last 10 matches and are six points outside the play-off places, with seven games to play. They host struggling Fulham on Tuesday, while Paul Lambert's 14th-placed Rovers travel to Sheffield Wednesday. "I'm disappointed to lose. It was an absolutely fantastic effort with 10 men. "I thought we started the game brilliantly, were well on top, got the goal. The penalty changes the course of the game, but it should never have been a penalty. "Danny Graham was fouled at the edge of the box so the ball should have never been at that end of the pitch, because Danny has nutmegged the guy. You can see with Danny's reaction that he's definitely been fouled. "I thought today, he got more calls wrong than he got right. If there's a delegate here or somebody watching it, maybe they might get a phone call in the morning." "He's done well, Jordan. He's a handful. He knows what he needs to do. "I'm delighted for him. It's a great ball from Gally (Paul Gallagher). He knows where to put it and the areas for people to get into. "It wasn't an easy finish but he's delighted and we were all delighted to see it hit the back of the net. "I think it (the sending off) was the correct decision. They started the game better than us. I'm disappointed we gave away the goal we did but it's handball on the line and the referee made the right decision." Match ends, Blackburn Rovers 1, Preston North End 2. Second Half ends, Blackburn Rovers 1, Preston North End 2. Attempt saved. Danny Graham (Blackburn Rovers) left footed shot from the centre of the box is saved in the bottom right corner. Assisted by Jordi Gómez. Attempt blocked. Jordan Hugill (Preston North End) left footed shot from outside the box is blocked. Assisted by Jermaine Beckford. Foul by Jordan Hugill (Preston North End). Thomas Spurr (Blackburn Rovers) wins a free kick on the left wing. Bailey Wright (Preston North End) wins a free kick in the defensive half. Attempt missed. Jermaine Beckford (Preston North End) left footed shot from the left side of the box is close, but misses to the right. Assisted by Paul Gallagher. Substitution, Preston North End. Jermaine Beckford replaces Joe Garner. Attempt blocked. Daniel Johnson (Preston North End) left footed shot from the centre of the box is blocked. Assisted by Calum Woods. Substitution, Preston North End. Paul Huntington replaces Adam Reach. Greg Cunningham (Preston North End) wins a free kick in the defensive half. Foul by Jordi Gómez (Blackburn Rovers). Daniel Johnson (Preston North End) wins a free kick on the right wing. Attempt saved. Chris Brown (Blackburn Rovers) header from the centre of the box is saved in the top centre of the goal. Assisted by Elliott Bennett with a cross. Foul by Adam Reach (Preston North End). Darragh Lenihan (Blackburn Rovers) wins a free kick on the right wing. Danny Graham (Blackburn Rovers) is shown the yellow card. Attempt blocked. Calum Woods (Preston North End) left footed shot from outside the box is blocked. Assisted by Joe Garner. Attempt saved. Paul Gallagher (Preston North End) right footed shot from outside the box is saved in the centre of the goal. Substitution, Blackburn Rovers. Chris Brown replaces Hope Akpan. Elliott Bennett (Blackburn Rovers) wins a free kick on the left wing. Attempt saved. Greg Cunningham (Preston North End) left footed shot from outside the box is saved in the centre of the goal. Assisted by Daniel Johnson. Corner, Preston North End. Conceded by Thomas Spurr. Substitution, Preston North End. Daniel Johnson replaces Ben Pearson. Corner, Preston North End. Conceded by Elliott Ward. Attempt missed. Joe Garner (Preston North End) right footed shot from outside the box misses to the right. Assisted by Ben Pearson. Corner, Blackburn Rovers. Conceded by Tom Clarke. Elliott Ward (Blackburn Rovers) is shown the yellow card. Elliott Bennett (Blackburn Rovers) is shown the yellow card. Ben Pearson (Preston North End) is shown the yellow card. Foul by Ben Pearson (Preston North End). Attempt saved. Joe Garner (Preston North End) right footed shot from the centre of the box is saved in the bottom left corner. Assisted by Calum Woods with a cross. Attempt missed. Ben Pearson (Preston North End) right footed shot from the centre of the box is close, but misses to the left. Assisted by Adam Reach.